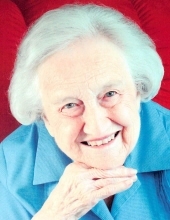 Margaret T. Bixler, age 101, passed away peacefully at home in Woodbridge, CT on November 24, 2018. She was predeceased by her beloved husband of 69 years, Roland M. Bixler. Margaret was born in Bluffton, Ohio to Ray L. and Etta (Lantz) Triplett. She was also predeceased by her brothers, Morris Triplett and Ropp Triplett, and her sister Barbara Jean Triplett Van Dyke. Margaret attended Bluffton University and held a BA from the University of Michigan. Through the years she was active in her community, especially the New Haven YWCA and the Church of the Redeemer in New Haven. She was a member emeritus of the board of Yale Divinity School and was co-chairman of the Friends of the University Library of the University of New Haven. After lovingly raising her two children, Margaret went back to school and earned her MA from the University of New Haven. She held a special interest in the study of Native American Code Talkers and wrote the book Winds of Freedom, telling their story. She made presentations before many schools and organizations. She sat on the Advisory Council and was a former member of the Board of Trustees of Crow Canyon Archaeological Center, CO. Most of all, Margaret loved her family and friends. She was a wonderful wife, mother, mother-in-law, and grandmother! She is survived by son David Bixler of Woodbridge, daughter Katharine (Robert) Holt of Bethany, as well as her grandson Ryan Charles Holt, also of Bethany. Also left to cherish her memory are many beloved nieces and nephews. The family wishes to thank our mother's very special caregivers: Pearl, Irish, Penny, Tanya, Debbie, and Tammy. When you think of Margaret, you will be reminded of a woman filled with beauty, grace, and kindness. Per Margaret's wishes, services will be private. For those who wish, donations may be made to Connecticut Food Bank, 2 Research Parkway, Wallingford, CT 06492, www.ctfoodbank.org. Arrangements are in care of Beecher & Bennett Funeral Home, 2300 Whitney Avenue, Hamden. To send flowers or a remembrance gift to the family of Margaret T. Bixler, please visit our Tribute Store. "Email Address" would like to share the life celebration of Margaret T. Bixler. Click on the "link" to go to share a favorite memory or leave a condolence message for the family.